Klik på billedet og se alle billeder fra Sardunya Andifli Otel. 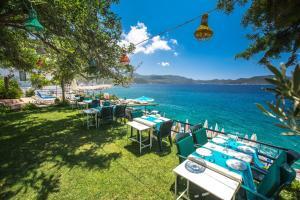 Sardunya Andifli Otel features air-conditioned rooms in Kas. Located around 200 metres from Kas Lions Tomb, the hotel with free WiFi is also 400 metres away from Kas Bus Station. The property is 400 metres from Hellenistic Theatre. At the hotel, the rooms are fitted with a wardrobe. With a private bathroom, certain units at Sardunya Andifli Otel also boast a sea view. At the accommodation all rooms are equipped with a flat-screen TV with satellite channels. The restaurant at Sardunya Andifli Otel serves Steakhouse and Turkish cuisine. The hotel offers a sun terrace. Speaking English and Turkish at the 24-hour front desk, staff are always at hand to help. Kas Yacht Marina is 400 metres from Sardunya Andifli Otel, while Kas Ataturk Statue is 600 metres from the property.